It's delicious. Ideal finger food. 6 yummy twin packs. No artificial anything. Whole wheat flavour. Suitable for 7 months+ to grown ups. Soft baked for little mouths. Encourages self feeding. No added salt. No artificial flavours, colours or preservatives. Suitable for... vegetarians. 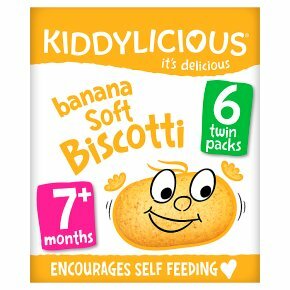 KIDDY CARE: Kiddylicious Soft Biscotti are specifically developed for children from 7 months. Always supervise young children whilst they're enjoying them.